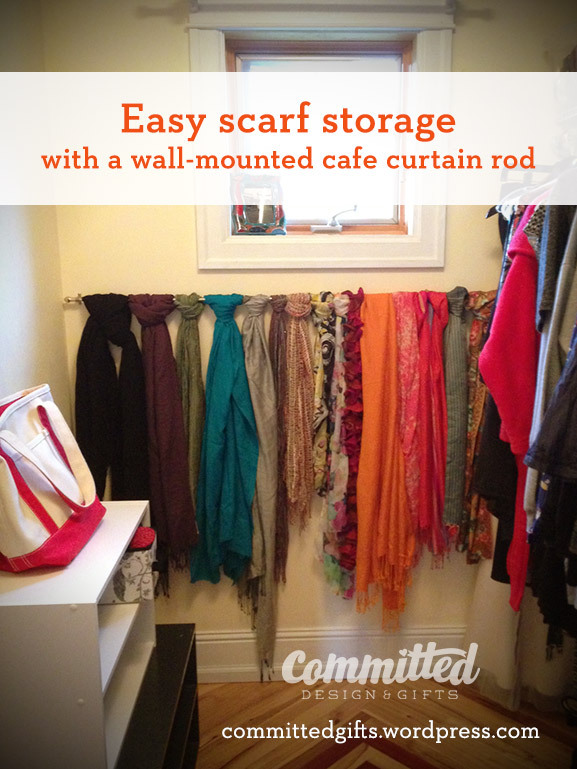 A Pain in the Neck: Scarf Storage | Committed. Love the part about your shoe-less attempt at leaving for daycare. Great post, Jen! I am going to investigate doing something similar in my closet. Thanks! Sharing! Thanks, Rochelle! Glad it was an idea worth sharing! *drools* I…I have to have this in my closet now. What about hats? Any ideas on how to store dozens of hats? Baseball hats, sun hats, helmets, knit caps, or a combination? If they’re baseball hats, I’d say just a clear rubbermaid/tupperware box so you can still see them, but they’re corralled. If they’re different styles, and you want to display them, maybe a pegboard with hooks. I have lots of fancy English-Lady style hats…as well as a Janet Evanovich “Rangeman” cap (I’m kind of proud to own that one…) and a huge sun-hat. You could do it without the picture frame and just string up picture wire between two screws or nails (be sure you’re screwing into a stud for security). Use clothespins to hold them up! It will only make 2 small holes in the wall. I like the scarves there. Thanks! It’s making much happier to go into the closet every morning.